This interactive simulation offers a way for students to explore the connection between uniform circular motion and simple harmonic motion. The display shows two blocks on springs oscillating horizontally, and two balls traveling in uniform motion in a circular path. The user sets initial values for the blocks: amplitude, mass, and spring constant. The two balls are automatically set to the same values. Students are able to see that the circular motion of each ball corresponds to the motion of the blocks, thus promoting understanding of the basic equation for objects undergoing simple harmonic motion. To extend the learning, users can set values for the phase angles of each block. Also included by the author is a set of suggested activities to accompany the simulation. 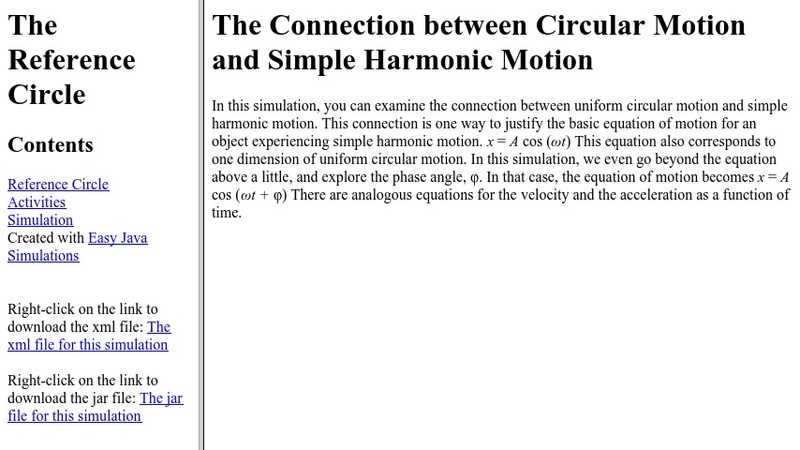 See Related Materials for an extensive online multimedia tutorial from PhysClips on the topic of simple harmonic motion. This applet was created with EJS, Easy Java Simulations, a modeling tool that allows users without formal programming experience to generate computer models and simulations. Choose trigonometric functions to model periodic phenomena with specified amplitude, frequency, and midline. ?